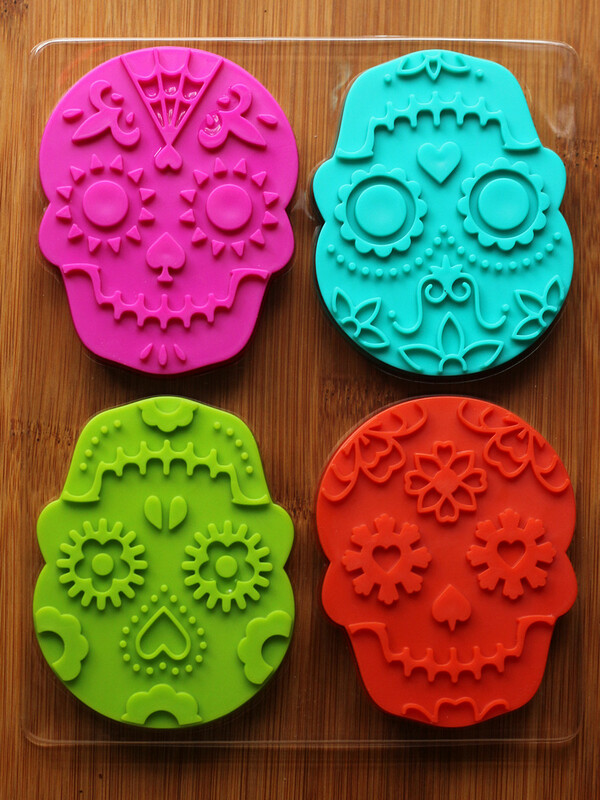 These cookie cutters just make me laugh. I've seen all kinds of gingerbread cookie cutters - men, women, ninjas ... even some with bites taken out of them. But these cutters look inside the gingerbread men and show you the BONES. Yup. Bones. Inside gingerbread men. They're Gingerdead Men! Sure, you could use these for Halloween, but they'd be a riot for Christmas, too. Got a doctor in the family? Or someone who works with X-rays? Or a nurse or medical student? I'm sure they'd get a laugh out of these. Or maybe even an athlete who's been known to crack a bone or two? Or someone who's interested in archaeology? Or just someone with a quirky sense of humor. These would be a perfect sweet gift - either the cutters themselves or a box of baked and decorated cookies. Speaking of decorating, the design isn't overly complicated, and the area to be filled is wider than some cutters I've used, so these would be a little easier for kids to decorate. And wouldn't these be perfect for home made dog treats? hehe. The way these work is that you stamp the cookies first, then cut them out with the other side of the stamp/cutter - they're one piece, so there aren't pieces you could lose or misplace. While there's just one cutter design, you can give your cookies a little more individuality by cutting the cookies at slightly different angles - up, down, sideways - to make the fellas look like they're looking in different directions. If you don't want to stamp the cookies, you can just the cutters for regular gingerbread men, and decorate any way you like. 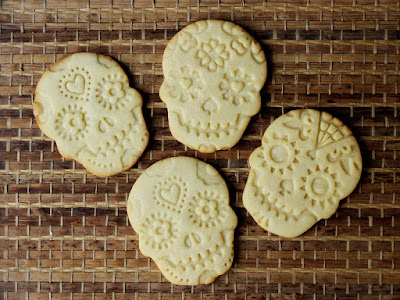 I thought these were much cooler looking with the "bones" filled with white icing, but they also looked good undecorated - the impressions are deep enough that you can see the design really well without decorating. I also tried brushing some cookies with an eggwash for a shiny look on the raised areas - there are a lot of options for decorating these! I used a basic vanilla cookie recipe for these, but of course they'd work with any roll-out cookie recipe, whether it's vanilla, chocolate, or gingerbread. If filling the indents with icing seems like too much trouble, you could also sprinkle these with powdered or colored sugar and brush the sugar off the raised areas. The decoration wouldn't be as permanent (and a bit more messy), but it would still look good on a cookie tray. Who's it for: Anyone who likes interesting cookie cutters! Pros: Fun! Easy to use. Wishes: It would be cool if there were several sizes of these, to make a whole gingerdead family! I have a lot of tea - in bags, loose, and even some Greek mountain tea that's still on stems. The ones in teabags are easy enough to deal with, but loose tea is a whole other story. I like drinking it, and I like mixing some of the flavors. But what I don't like is when I get to the bottom of the mug and I end up with bits of ... stuff. I mean, I know the tea leaves and herbal bits are edible but that doesn't mean I actually want to eat them. I've tried a number of different tea-brewing things, but I'm always on the search for something that's better. Recently, Frieling sent me their stainless steel infuser. 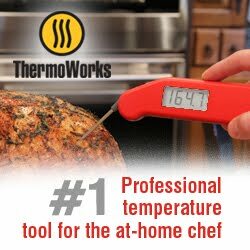 It's made from 18/8 stainless steel, so it's completely food-safe, and pretty much indestructible with regards to normal kitchen use and dishwashing. I mean, you could run it over with your car or go after it with a chainsaw, but you're unlikely to damage it making tea. The holes in the infuser are sufficiently small that you're not going to get leaves and bits into your tea, and it fit well in every cup I tried. I'm sure there are some odd-shaped cups out there where this wouldn't fit, but if you have one of those, you probably have another. One unique feature in this infuser is that there's a cover that you can use on top of the infuser to keep the water warm during steeping. Then, that same cover can be used as a base to hold the infuser after you take it out of the cup, so you don't have a tea-filled drippy thing to contend with. When you're done making tea, the bottom of the infuser comes off so it's easier to clean out, which is a huge plus. I hate it when I try to rinse itty bitty leaves and bits out of a regular infuser and they just cling, so that removable bottom makes me happy. Overall, I like the infuser. The only small issue I have - and it's just me - is that it's pretty large and I don't measure tea, so I've made a few cups of tea that are stronger than usual. I'm getting used to it, though, and more recent cups have been less potent. Then again, maybe you prefer a strong brew. Pros: Easy to clean, fine holes, stainless steel doesn't pick up odors so your mint tea won't taste like chai. Cons: Can't think of any - it works well. More info: You can find Frieling on Facebook, Twitter, Instagram, and Pinterest. I use fresh ground pepper exclusively. Although I might have an ancient can of pre-ground stuff stuck in the back of a cabinet somewhere, I never use it. I have a couple of different grinders for different purposes. The one thing I never saw a major need for was a salt grinder. I have a few, and they look cool. They're fun on the table. Maybe for a finishing salt when you want a rougher texture. But in the end, it's just plain white salt that you're grinding - and salt doesn't get stale like pepper does, so "freshly ground salt" doesn't make a bit of difference if you're cooking with it. But when Kyocera offered me their dual grinder to test, I thought I'd give it a shot. Or a grind, I guess. I filled it with black peppercorns and I raided a couple other grinders for coarse white salt. And then I read the instructions. Woah. This is something to re-think. Because the grinding mechanisms are ceramic rather than metal, you can use this for "wetter" salts as well as regular salt. And you can use it for spices other than pepper, if that amuses you. Okay, it's not the most earthshaking thing on the planet, but after I read the instructions, I dumped the white salt back into the original grinders, and I dug out a jar of a gray coarse salt that has been languishing in my pantry. It was a little too coarse for most uses, and too wet for a grinder with a metal mechanism. Not only does the grinder look cooler with the pebbly gray salt in it, it means I'm actually going to use that goofy salt. And for folks who like the idea that the gray, pink, red, black, and other salts carry minerals that pure white salt doesn't have - well, here's a way to use it more often. Not only could I use this grinder for salt and pepper, but I could use it for two different salts (gray and pink, maybe) or for black pepper on one side and white pepper on the other. Or, if you have other spices or spice mixes that you like to grind, this could be ideal. Oh yeah, and the grind size is adjustable, there are caps on both ends so nothing's going to get messy, and it's easy to fill. It has a pretty design so it would look good on a dining room table (without being pretentious) and it looks sturdy and easy to clean, which means it's great for the kitchen. Who's it for: People who use salt and pepper. Okay, fine, people who use salt, pepper, or other spices and who are looking for a nice grinder. 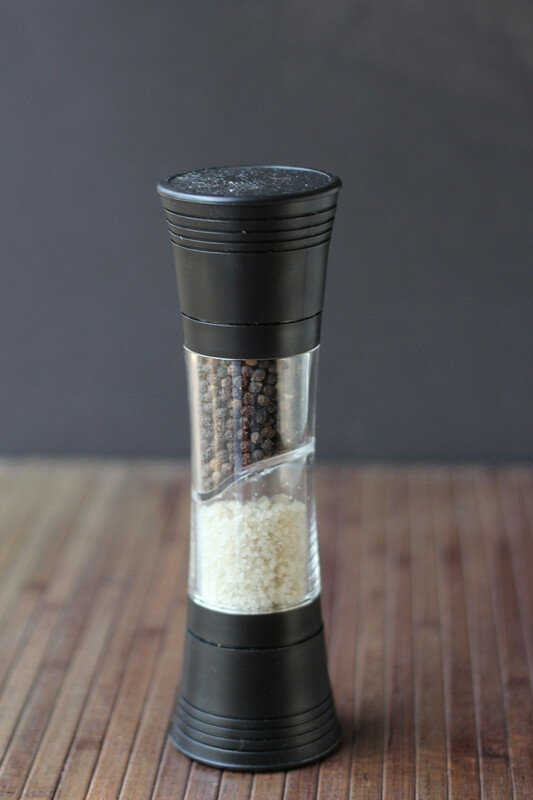 Pros: Nice design, easy to use and keep clean, works well, can be used for "wet" salts and for spices other than salt and pepper. Cons: It's not huuuuge, so if you grind vasts amounts of stuff, this isn't what you're looking for. However, for normal cooking and table use, it's plenty big. Wishes: Not really a wish for the product, but I'm going to take a hard look at the grinders I use and maybe buy one or two more of these transfer some spices into dual grinders. We'll see. More info: You can find Kyocera one Twitter, Facebook, and Pinterest. You might have heard of the Vinturi that's used to aerate wines by the glass so you don't have to wait for you wine to "breathe" before drinking. You might have heard of that, but did you know that there's a similar product for spirits as well? It's called Vinturi Spirit . While people don't generally let their brandy or rum breathe, aerating it does change the flavor. I tried it. I like it. 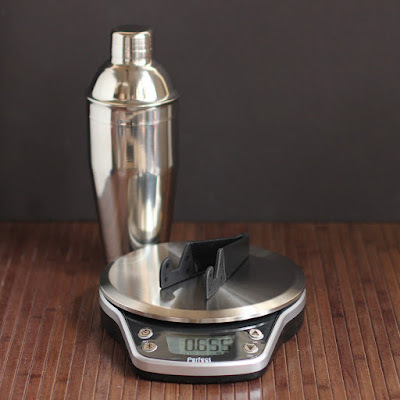 The Vinturi for spirits has measurement markings for 1, 1 1/2, and 2 ounces, so you can use it to measure as well as aerate. You fill it to the line, then press the button and release the liquid into your glass. The flavor of the liquor changes. For sure. The sharp edges disappear and the flavors are rounder and mellower and more pleasantly drinkable, but at the same time you can pick out the nuances. I particularly liked the transformation of Bracamenta, but it was also fun to test it with other spirits. While it makes good quality liquors better, it makes less-expensive liquors good. It's nice for making your evening nip a little nicer, but it would also be a whole lot of fun for tastings at parties. Try a sip as-is and try a sip after aerating and see what your friends think. This works best when you like your drinks neat, but you can pour it over ice, as well. But as the ice melts, the effect of the aeration wears off. If you pour water into the drink, you lose the effect immediately, so forget about that drink with a splash. Or maybe not. After doing some sampling, I thought, hey, liquor has water in it, so maybe adding a splash of water to the liquor before aerating would work. And, surprise, it did. There's probably an upper limit to how much water you can add before the effect disappears, but if you're adding that much water to your drink, you probably aren't looking for subtleties in the liquor. Who's it for: Folks who like spirits and drink them neat, on the rocks, or with a small splash of water. Also fun for tasting parties. Pros: It really does what it says. Attractive. Cons: Not going to help that cheap tequila in a margarita. Wishes: Can't think of any.